Every year, HMS upgrades hundreds of domestic heating systems, replacing old, inefficient boilers with new high efficiency models. This reduces fuel consumption, which offers savings to customers across the North West . In 2017/18 alone, over 600 systems were upgraded and HMS carried out over 18,000 repairs to existing systems and over 17,000 gas services. HMS has been carrying out installations of new heating systems since its inception back in 2011, and has installed at least one new boiler every day since then. This service is delivered by HMS across both domestic and commercial properties, covering all aspects of work including servicing, repairs and installations. The work is delivered by HMS’s award winning in-house team of directly employed, highly trained gas engineers. HMS’s Gas team has won Morgan Lambert’s national gold award for excellence in gas safety for an unprecedented 5 years running, as well as two national awards from AGSM for best performing partnering contractor. The Gas Team has recently signed an agreement with boiler manufacturer Vaillant to become their Warranty Contractor of choice and are the first in the North West within the sector to sign such an agreement. HMS aims to operate a service that puts the needs of the customer first. In addition to normal working hours, HMS also offer customers late appointments on weekdays and appointments on Saturdays. Any additional needs are also considered to cater for the customer’s requirements. HMS also recognises customers’ diverse needs and aims to fully inform customers of appointments and expected times of arrival. For routine appointments, customers are informed of the date and time of the appointment as soon as they get in touch. For more complex repairs, a customer will be contacted by letter. They will also receive text reminders 48 hours before the repair is due to be carried out. For all repairs, HMS will call the customer when the operative is en-route to inform them that they are on their way. This allows the operative to introduce themselves to the customer and also gives the customer an estimated time of arrival. Upon arrival at the property, the operative will show the customer their ID badge in order to assure the customer that they work for HMS. If the nature of work is such that a follow-up appointment is required, this is arranged while the operative is on site so that the customer is aware of the appointment time for the follow-on repair. Carol from Tuebrook is a tenant of Liverpool Mutual Homes. Her previous heating system was old and prone to faults, meaning that it wasn’t energy efficient. 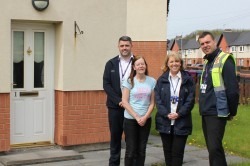 HMS upgraded the system and replaced the old gas fire at the property as part of a 2-day job, which has led to a reduction in heating bills for Carol and means her home is gas safe.